Please visit http://hfsnatchez.weebly.com for more information on the Holy Family School. 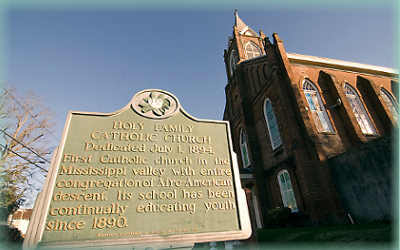 The Holy Family School was founded in 1890, and is one of the oldest African-American Catholic schools in the country. It was created out of need to educate young African-American children, most of whom were descendents of slaves, who were not receiving a quality education during the time of segregation. Once a school that educated children from the ages of two to eighteen years of age, the school has had to cut grades one through twelve over the years. It is now an Early Learning Center, educating children ages two through five. Many of the families in Natchez are attracted to the school because of its strong commitment to academic excellence and on whole character education. Students who have attended Holy Family have a higher rate of high school graduation than those who did not attend the school, and many students have gone on to be very successful students and professionals. In a city that is 44% white and 55% black and is still very much divided racially and economically, the Holy Family Early Learning Center provides a quality education for many of the children in the city. A high quality education is hard to come by in Mississippi, as Mississippi public schools are ranked 48th in the United States. Therefore, many families turn to private schools to educate their children. Tuition costs for other private schools in Mississippi are significantly more expensive than they are at Holy Family. Furthermore, the other private school options in Natchez consist of predominantly white students in an overwhelmingly white neighborhood. Issues of racism and discrimination are still heavily present in Natchez and are potentially impacting the educational barriers that black students in Mississippi continue to face. The Holy Family School is an academically superior option for these students, which is one of the reasons this school was so important to Carly. When the school became an Early Learning Center five years ago, the Archdiocese stopped financially supporting the school, citing the fact that it was no longer considered an elementary school. This budget cut severely impacted the year-to-year stability of the school. For several years, the school was also supported by the Josephite Community, but the funding was depleted, and the school no longer received financial assistance from that community. The school is currently run by Sister Bernadette McNamara and Ira Young. They work tirelessly to ensure that students and teachers feel supported. In addition to the day-to-day tasks at the school, Sister Bernadette also spends much of her time writing and securing grants to ensure students can continue to be educated at the Holy Family Early Learning Center. She has secured funds from the Black and Indian Mission, as well as funds from her own community. However, due to the rising costs of running a school, it is simply not enough. The Boston College Lynch School of Education has a $10,000 annual commitment to the school, all of which goes directly into school upkeep and scholarships for the students. Since September of 1998, under the leadership of Associate Dean John Cawthorne, the faculty, staff and students in the Lynch School have dedicated themselves to assisting Holy Family. Since the inception of this partnership, more than 150 boxes of books and supplies and over $450,000 in cash donations have been sent to the school. More than 10 students have traveled to Natchez, Mississippi over their winter or spring breaks to teach lessons at the school, assist in construction work and maintenance work, and to build and form meaningful relationships with the students and faculty at the Holy Family Early Learning Center. One of the reasons that Carly felt so immediately attached to this school was because of her own ability and passion to spread love to those around her. The teachers’ love for their students is obvious. They want their students to work hard to gain academic skills and confidence so that they can start out on a strong path when they enter older grades; most of the students will enter the Mississippi public schools. The teachers also want to make sure that their students feel a sense of belonging at the Holy Family School. Amidst contextual factors that may impede students’ focus or well-being, the teachers want to ensure a home for these students. It is clear that this is accomplished because of the way all visitors to the Holy Family School are immediately embraced. Carly felt immediately at home when she arrived in Natchez for the first time four years ago, and it was her wish that the school will continue to provide a quality education for its students for years to come.